My dear hubby brought back some old barn wood from Kansas. It was waiting in the garage for a project. After seeing so many pretty centerpieces from bloggers, I knew what I wanted him to make me. Isn't this box so pretty? I LOVE it and see so many possibilities throughout the year! The box measures 30" long x 6" high x 6" wide. Thanks, Honey!! I put some faux greenery inside and used my battery operated lights along with some candles that are lifted on top of some glasses for height. Yes, I'm using my old Target dishes again, along with red Cambridge flatware . I like adding a colorful topper over a cream colored tablecloth. I used my King's Crown cordials because I love them! I made Christmas Crackers, by saving empty paper towel rolls, cutting them and using as place cards, filled with surprises, wrapped and tied on the ends with pretty ribbon. For our Christmas Eve dessert, we had Peppermint Ice Cream with a cookie crust. It's a perfect ending to a delicious meal. One of my DIL's said, "This is my favorite dessert"! 1/2 gallon of peppermint (or any favorite flavor) ice cream, softened in refrigerator. Hot Fudge sauce, recipe found here. Or, you can use store-bought fudge sauce, but the sauce recipe is easy and oh, so good! Crush Oreos in food processor (or in a food storage bag with a rolling pin). Add the melted butter and mix well. Put in the bottom of a springform pan (if you don't have a springform pan, you can use a pie pan or even a 9 x 13" pan) and pat down. Freeze. Add half the ice cream on top of the cookie crust. Put in the freezer for about an hour, while you make the hot fudge sauce. Return the other half of the ice cream to the fridge. Take the springform pan from the freezer , add half the fudge sauce and return to the freezer for 20 minutes. Take the pan out of the freezer, add the other half of the ice cream and and the rest of the fudge sauce. Cover with foil and freeze several hours. When ready to serve, let the dessert sit on the counter for 15 minutes. If needed, you can run some warm water around the outside edges of the sprinform pan, to unmold. If using a pie pan or 9 x 13" pan, just cut and serve. Yes, we did have a "White Christmas" in the Dallas area!! Recently, Nancy of twocottagesandtea.blogspot.com/ had a giveaway and I was the lucky recipient! I would like to show you the wonderful gifts that Nancy so lovingly packaged. Along with a beautiful teacup card, Nancy mailed a darling book, called Afternoon Teas, a miniature teapot and teacup, a beautiful lace doily, tea party guest towels and six adorable tea related push pins. Thank you, dear Nancy, for these special gifts! As the box of pins says, "A Sip of Tea Warms the Heart". My heart is warmed by your thoughtful kindness. Now, if you'll excuse me, I'm going to sit by the fire with Santa and enjoy my new book and a cup of Holiday Spice tea. My Royal Windsor teacup goes beautifully with my lacy doily, don't you think? How about some tea and cookies by the fire? The wooden Santa was made by our second youngest son when he was in 10th grade. It's made from a fence post and then he painted it. I made the hat and made a beard and hair for Santa out of a mop. Our youngest son gave me this tea set when he was a little tyke. He bought it at Wal Mart and I think it's the cutest set for Christmas time. Our daughter bought this adorable baking Santa. Isn't he cute with his chef's hat and apron? I love the basket of french bread and the cherry torte. She also bought the mini utensils for my tiny tree. I love making spritz cookies. You can find my favorite recipe here. This cookie has so much flavor with the orange zest and the cinnamon. This time I added a glaze. Mix ingredients together and dip the tops of the cookies into the glaze orjust spread it on. Add sprinkles immediately before the glaze hardens. Carlene's is in a rustic pail. 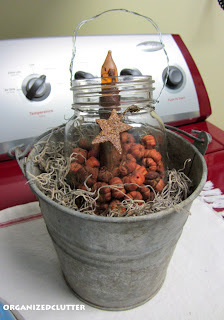 The inspiration for my rustic canning jar came from Carlene at organizedclutterqueen.blogspot.com/. I saw this cute decoration that she made back in the Fall and knew that eventually I wanted to make one for Christmas. I found the candle at a local shop and went to work. I had the canning jar, some leftover fake snow, stuck a sprig of greenery in and a pinecone, sprinkled some more snow, put the candle in and voila, a cute, homey decoration for my kitchen. some faux snow, surrounded by mini ornaments. For my tablesetting, I used my trio of iron angels that I bought years ago at a local trade days. They are holding star tealight holders from Wal Mart. I used my little trunk that I fix seasonally. It is filled with greenery and berries and a big bow. My grandmother's gorgeous lace tablecloth is scrunched up underneath. I love doilies and used two as placemats for our cozy dinner for two. I used my Old Britain Castles with my Target plates, by Furio on top. I love the mix of colors and patterns. Flatware is my red Cambridge from Homegoods. Crystal is our wedding pattern, Elyse by Franciscan. The pretty cordials are Ruby King's Crown tied with a little ornament, with our names. These make great placecards for our whole family! A poinsettia with a ribbon is tied around a green ribbon. I had this recipe saved for quite awhile before I made it. What took me so long??!! It was originally found on Sugar Pie Farmhouse. It really isn't a pie that you cut and serve, but more a scoop out and serve. The wonderful thing about this meal is that everything, including the spaghetti noodles, is done in the same skillet. When I first made it, I used my cast iron skillet, but everything barely fit. When I made it again, I used my largest skillet. I don't think I'll ever make spaghetti the old way, after trying this. It is dee-lish!!! In an 11-inch or larger cast iron skillet (or skillet with a heat proof handle), saute onion in olive oil on medium heat for 5 minutes. Add ground beef and sausage and cook over medium-high heat. When almost brown, drain any grease, then add garlic, parsley, red pepper flakes, oregano, and Italian seasoning. Once the ground beef and sausage is browned, stir in the crushed tomatoes, water, sugar, and salt. Add broken spaghetti, pushing down into the liquid. and cover for 8 minutes. After 8 minutes, stir pasta so the noodles don't stick together. Reduce heat to medium-low and simmer for 6 minutes, or until pasta is al dente. Add basil, Parmesan cheese and cream, stir well. Sprinkle top with mozzarella cheese, put in oven to broil until spotty brown (watch carefully!!). NOTE: This can be made in a big pot and then poured into a 9 x 13" pan. However, if it is pyrex, do not broil, just bake at around 375 degrees until cheese is melted.